The dentists at River Dental in Medicine Hat provide full service dental care to meet the individual needs of each and every one of our patients. Our general dentistry services focus on prevention first, and include oral hygiene cleanings and dental restorations. 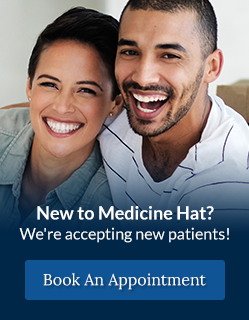 Our Medicine Hat dentists offer braces and Invisalign® orthodontic treatments to help you create a healthy smile. At River Dental, we provide a range of cosmetic dental treatment to help improve the appearance of your smile. At River Dental in Medicine Hat, we'll create a custom Pure Power mouth guard to protect your teeth during sports.